Be the first to share your favorite memory, photo or story of Robbye. This memorial page is dedicated for family, friends and future generations to celebrate the life of their loved one. Robbye Louise Jones, age 90, died Tuesday May 2, 2017 at an Oklahoma City care facility. She was born August 3, 1926 in Haskell County, Texas to Riley Terrell and Annie (Harwell) Jeter. 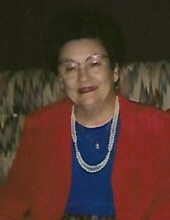 She grew up in rural Haskell County and was a 1941 graduate of Sagerton High School. She later attended Hardin-Simmons University to attend dietary training. Robbye and her husband Floyd Ray “Jack” were married on April 17, 1944 and celebrated over 53 years together. She was a housewife well known for her culinary skills, one being homemade from scratch, banana pudding. Her adult life was spent in Big Springs, Cisco and Lueders, Texas until 2005 when she moved to Piedmont, OK to be near her daughter Gayle. Robbye was the last surviving spouse or sibling of her husband Jack’s 14 brothers and sisters. She was a member of 1st Baptist Church of Lueders. She was preceded in death by her parents, her husband Floyd Ray “Jack” Jones, one son Douglas Winston Jones and one son in law Edwin Roberts. Survivors include one son Donald Ray Jones of Lueders, TX, one daughter Gayle Roberts of Piedmont, OK, one brother Rev. Jack Jeter and wife Fran of Rusk, TX. Also five grandchildren, Jana, Amanda, Todd, Robyn and Samantha and six great grandchildren as well as a host of nieces, nephews and other family members. A time of visitation will be held from 12:00 noon until service time at the 1st Baptist Church, Stamford. Services will be held at 2pm on Monday, May 8, 2017 in the 1st Baptist Church, Stamford, TX with interment following in Highland Memorial Park Cemetery, Stamford, TX under the direction of Groves-McNeil Funeral Service, Piedmont, Oklahoma. To send flowers or a remembrance gift to the family of Robbye Louise Jones, please visit our Tribute Store. "Email Address" would like to share the life celebration of Robbye Louise Jones. Click on the "link" to go to share a favorite memory or leave a condolence message for the family.